What's your all time favorite concet? Corbin Reiff may disagree. Come share yours as he discusses his new book Lighters in the Sky: The All-Time Greatest Concerts, 1960–2016. 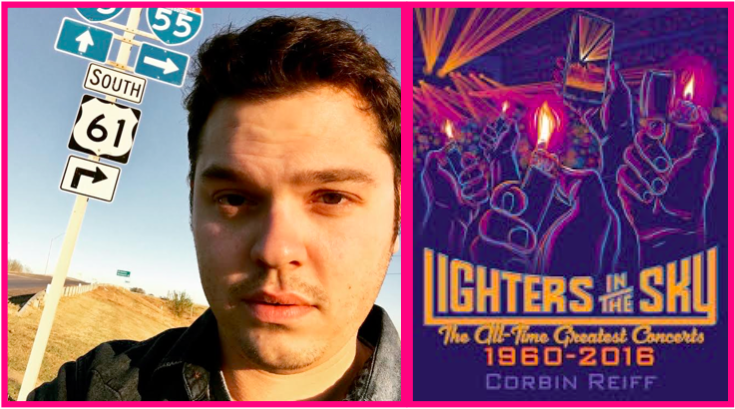 Corbin Reiff is the author of Lighters In The Sky: The Greatest Concert Of All-Time 1960-2016. He is currently the Deputy Music Editor at UPROXX and has contributed to some of the biggest publications around including, Rolling Stone, Spin, The Washington Post, Pitchfork, Complex, Guitar World, and The A.V. Club to name a few. He lives in Chicago with his wife Jenna and his two dogs Page and Hendrix. Live. In the age of the studio and digital downloads, that four-letter word stands as the true test of the performer’s talent and the fan’s commitment. The true greats deliver in concert, and every once in a while they deliver with a sound and fury that rings through the ages. James Brown at the Apollo. Led Zeppelin at Earl’s Court. Nirvana at Reading. The night Tupac, Biggie and Big Daddy Kane found a stage big enough to share at Madison Square Garden. Radiohead at Glastonbury. Some shows crystallize a particular moment in a great performer’s career, like Bowie’s farewell to Ziggy Stardust at the Hammersmith and Prince’s epic set at the Forum at the height of his purple reign. Some—the original Woodstock, The Last Waltz, Lollapalooza ’91 and Coachella ’99—define an era. The live moment can be hard to capture with a microphone or a camera, let alone on the page. In veteran music writer Corbin Reiff’s deep dive through decades of epic gigs—often including interviews with the participants—he brings these concerts crackling back to life with revealing and lost details about what it was like on the stage and in the hall. Here are the cultural contexts, the backstage dramas, the split-second artistic decisions and the technical details behind the best shows of our amplified age. Year by year, concert by concert, this is a book that’s loud and guaranteed to start an argument.